"This is a spiral we're in; a long wave undulating in one constant direction without ever crashing on the shore. Listen." I sat with them in the mess hall of our new ship. Some of these people I had worked with for years. Others were new to me, and had joined as parts of a process that now felt like a procession. "Everything leads you to where you are." I was a member of the Sanctuary, a corporation that belonged to the benevolent Sisters of EVE. While the Sisters as a whole concerned themselves with the betterment of mankind, their subfactions went about achieving that goal in entirely different ways. The Sisters of EVE corporation, which was the largest part of the Sisters of EVE faction, consisted of rescue workers and aid specialists, and all in all were the exact kind of people you wanted to see in the aftermath of a cataclysm. The Food Relief corporation, meanwhile, concerned itself with the bureaucracy of aid, and had a tendency to extend its reach into diplomatic matters. The last of the Sister faction corporations - my own home and the domain of my calling -was the Sanctuary. They were a scientifically focused organization working within a faith-based dominion, and the combined focus of secular inquiry and religious discipline lent a particular fervor to their work. Their focus was the EVE gate, a wormhole that had collapsed onto itself thousands of years ago and left humanity stranded in New Eden. In recent times, a massive interstellar war that cost innumerable lives had also seen an increase in activity at the EVE gate. A team, led by me, had been investigating this new anomaly, and had eventually uncovered a strange signature, as if the gate were responding to something elsewhere in the cosmos. The signature was unrelated to any previous data and was thus discounted by most serious researchers. But I felt it was worth looking into. I believed that everything happened for a reason, and that the great gate would not grant me this single key unless it had something to unlock. It took a lot of patience, which sometimes ran dry, and energy, which was often used up, but eventually I made the connection. Many things had been happening when the gate started to pulsate, but one of the more notable events was the Minmatar invasion of Amarr space, and the re-emergence of Heir Jamyl Sarum, who repelled the invaders at her doorstep. The conflict, which had seen a massive fleet of warships torn to shreds, was shrouded in mystery and rumor. Some said Jamyl had merely willed the Minmatar ships to explode; others, that the fabled Minmatar Elders had seen their invasion brought to a halt and had enacted a suicide pact. 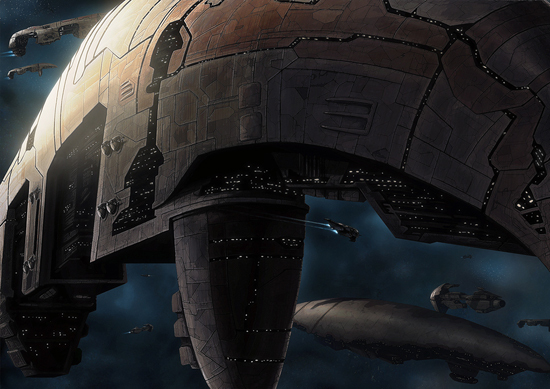 There were rumors of an Amarr superweapon couched inside an Abaddon battleship, but nothing had been proven and no public data was available. Whatever it was, the invasion event coincided with a spike in EVE gate activity. Moreover, once I had carefully picked apart the scant data on record from that momentous day in the skies above Mekhios, I discovered traces of that very same signature found in the EVE gate. The two were connected, I reasoned; the two must be connected. I knew I was on to something. Acquiring a small vessel and a few stores of investigative equipment - interest in the gate ran high in the Sanctuary, and my once-strict overseers found themselves perfectly willing to let their people engage in all sorts of strange excursions - I started a research experiment to determine whether the anomalous signature could be found anywhere else in New Eden. Despite the scant evidence I had to work with, I had to fight the constant urge to bring the entirety of my corporation onboard. The further I travelled along this dark new road, the more certain I was that I had been set on it for some reason that would eventually involve the fates of all my brothers. That certainty was only compounded when I travelled to Mekhios and found not only clear traces of the signature, but indicators of where else it might be found. Those indicators took the form of tiny rips in space, little pockets of anomaly where the laws of physics was turned inside out. They were too small to affect the ships that passed through them, and much too volatile to be of any use for scientific study. But they were there, present - inasmuch as the window to another world can be said to exist at all - and like my own titanium faith, a similar window to another world of strange wonders, they led inexorably to my ultimate goal. Like starry lights the little rips led me on a brief and hair-raising series of excursions, but only once did I risk losing my trail. It was on a jaunt into the deeps of Blood Raider space. The Blood Raiders, a gruesome and spacefaring sect of blood-worshiping cult called the Sani Sabik, had been involved in an assault on a station there, and little pools of antireality eddied around the place. It was as if the trail led in several different directions, one of whom seemed to go only deeper into the abyss of the Blood Raider world. I briefly considered following it, but resisted the temptation and set my gaze on a safe trail that led into Empire space again. There would be time enough to traverse the darker roads. That trail led me to the high faithful: The court of the Amarr Empire. Despite our differences, I could not help but respect those people and the immense power their faith had granted them. Their presence in this world was impressive, too. Colossal ships hovered past me in every direction, the golden sheen of their hulls reflecting the fire of the sun. In the distance I could glimpse the Empress's home at the Family Academy station in Amarr, and the caravans docking there bore the insignia and banners of high royalty. It made me wistful for something I couldn't explain: not a past I had missed, for the paths of my ancestry had never crossed those of the high royalty, but perhaps a future that might hold greater glory than I had ever imagined. So I thought intently, and I formulated a plan, and I snuck my ship into the holiest of holies apparently undetected, looking with manic fervor for something I did not yet understand and, I increasingly feared, might not even recognize if I found it. The signature was there but so were guard ships, and while I trusted my Sisters reputation to get me at the least through the outer circles of Amarr security, I was certain that at some point I would find myself in the unwilling company of armed men with little inclination to do anything but ask me stern questions at gunpoint, much less grant open passage. I sampled what data I could, my minute vessel dwarfed by the warships that idled by, and I got out in the assured belief that my presence there had not been noted or understood. Back at the Sisters base I spent several days and nights crunching the data, fuelled by the blinding fire of a righteous faith in my cause. I eventually found that I'd been close to the source already, for the latest data indicated that the signature was most present in T-IPZB, the depths of Blood Raider territory. It was a frightening and ecstatic moment, to realize that the trail went ever on and would lead me into the darkest of space. But I believed, in myself and in this. To mount an expedition into Blood Raider space would require a proper crew on a proper ship outfitted with the equipment and supplies necessary for such a hazardous venture. It would also require official permission, which I duly requested, and which was summarily denied. I was crushed, reduced to ashes and dust. My visions of a grand future, though barely formed, threatened to unravel already. The world was in the midst of interstellar war, the Sisters said, and while they respected the rights of their Sanctuary workers to continue their scientific inquiries, there were no ships, supplies or anything else they could spare to that effect. It was absolutely ridiculous, and it would have been laughable were it not so tragic. I could feel the spiral of events, this path I was on, curl and turn into a noose. I knew exactly where I needed to go and even had some inkling of the 'why'; a tenuous 'why', certainly, but I had faith and knew it was a necessary thing. In my desperation I started sharing information with anyone who would listen. I kept the destination to myself, but let enough slip that people knew I had an extremely important mission to undertake, one that involved the EVE gate, the Blood Raiders, and very possibly the truth of what happened on that fateful day of the Minmatar invasion. And just like that, the noose relaxed. It had been like this, always and always, when we wanted to help the people who needed our aid. The world found a way for us, and whatever needed to happen it made happen for us. I felt blessed and exonerated. I was given the ship, and given the supplies, and granted the crew. I looked over my people. We would go somewhere no one had ever gone, and play our part in the grand scheme. Everything leads you to where you are, I said to them. I gave them my name, and we moved on in faith.